“What’s happening in Venezuela is like a silent war,” Genesis Dávila, the director and founder of Defiende Venezuela, a human rights advocacy group, told America. She described a dramatic humanitarian and human rights crisis in her home country that is bringing terrible suffering to Venezuelans. Ms. Dávila, 28, is one of the small team of lawyers who defend Juan Guaidó, the president of the country’s National Assembly. After declaring himself the nation’s interim president in January until new elections are held, Mr. Guaidó is now recognized by 54 governments, including the United States. According to Ms. Dávila, the executive branch headed by President Nicolás Maduro “lacks legitimacy” but has de facto power, while Mr. Guaidó has legitimacy but not executive power. Venezuela in effect has two governments. The apparent stalemate concerns her greatly. “It makes me really worried to think we can get used to the situation,” she said. “I mean we got used to living with the chaos, to living almost without food or water, without medicines, without electricity and then with the government repressing people daily. Ms. Dávila was in Rome to participate in a conference at the Italian Senate on the crisis. After pursuing a leadership development course at Georgetown University in 2017, she returned to Caracas, where she founded Defiende Venezuela. Her organization assists victims of human rights abuses who seek international protection when the national mechanisms of rights protection fail. “It makes me really sad and frustrated when I hear people say they don’t want bloodshed in Venezuela,” Ms. Dávila said. “What do they think is happening now? According to Ms. Dávila, the Maduro regime was taken by surprise when Mr. Guaidó declared himself interim president. Venezeula’s Bolivarian National Intelligence Service, known by its Spanish acronym, Sebin, detained Mr. Guaidó, but he was quickly released because of the international reaction. He was warned not to leave the country, but Mr. Guaidó visited Brazil to seek the support of its new president, Jair Bolsonaro, and was able to return in spite of the Maduro government’s objections. The Inter-American Commission of Human Rights of the Organization for American States has issued precautionary measures to protect Mr. Guaidó, she said. Those protections were extended to include key members of his team. “While not taking direct action against him personally so far, Maduro’s government is seeking to undermine Guaidó’s leadership and has arrested his chief of staff [Roberto] Marero on March 21,” she said. It also forced Mr. Guaidó to leave the hotel that served as his headquarters. “Time is in favor of the Maduro regime,” she said. Its strategy, she said, “is to let things just happen, to try to not react, to make people get tired of the situation. They are expecting the people of Venezuela to lose hope, and Guaidó and his team to get tired of the fight. “Since last year there is shortage of food in Venezuela,” she said, “no medical supplies, hospitals can’t work, and the situation is even worse now because of blackouts—one cannot cook or preserve food, and communications is difficult. There’s an urgent need “to push for change within Venezuela,” but Ms. Dávila also encouraged more pressure from outside “because we cannot bring change by ourselves. We need the support of the international community.” She urged stronger sanctions against the regime’s politicians, the government and human rights violators. 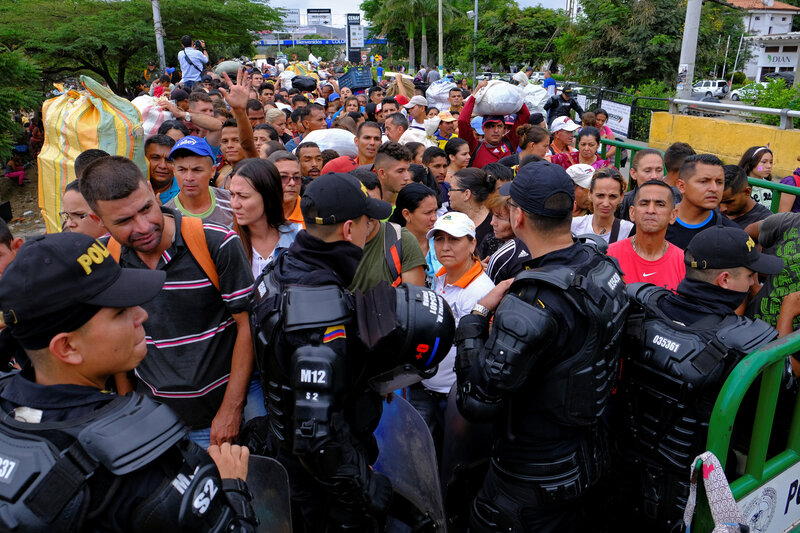 “We can continue to ask other countries to give the Red Cross the humanitarian aid that is needed,” he said, “and send it to Venezuela.” The United Nations Security Council is scheduled to discuss the humanitarian situation in Venezuela on April 10. Mr. Diamanti said he recognizes that the provision of aid “will not resolve the electricity blackouts, the absence of water and much else.” Indeed, in some ways it might enable the crisis to continue. Aid “will not resolve the electricity blackouts, the absence of water and much else.” In some ways it might enable the crisis to continue. Isn't socialism wonderful? Yet the Church is comfortable with it. The current leader of the Jesuits, Arturo Sosa, was a cheer leader for it in Venezuela. I was not aware how deeply the pernicious doctrines of Marx and his later interpreters had permeated the belief systems of self-identified intellectuals in Catholic organisations as to have the Pope and the Black Pope both emerging from that mire within the Jesuits; I searched Wikipedia for Arturo Sosa. I now have a feel for what it must have been like for a humble disciple of Christ at the height of the Arian heresy when a significant proportion of the Church held the false beliefs against the Trinity. Jesus took on human nature, suffered and died on the Cross to save us from sin and reconcile us with Our Heavenly Father. He neither opposed the law and the Prophets nor Caesar, he showed no preferential option to the poor and did not abolish illness, disability nor inequality. So does not opposing Caesar mean not opposing Maduro who is the Caesar of Venezuela? Was not Stalin Caesar for a while and therefore unopposable by christians? Also, I suppose we can add many other things to what Jesus didn't "abolish". Fornication, theft, lying, slavery. Are these things therefore acceptable? I don't get your point except that Dives might agree with it. Crocodile tears for the people of Venezuela. Venezuelan crude oil for the Koch refineries in Louisiana. That's what it's really all about, getting these South American governments back to ones that are useful. Sure, Maduro should go. But should Guiadó, chummy with the Bolsonaro creature, be what comes? It’s not Maduro but what he represents. He is a puppet for an evil system. Wherever the Church gets involved in politics it ends up supporting those who are oppressing people, its instincts in politics have almost been 100% wrong. In his recent essay Benedict warns of the political activity of the Church today. The only evil system is a non democratic one. Like, say, China or Walmart or Goldman-Sachs. You mean like the family, or any organization that succeeds. There was a close to true democracy in Ancient Athens and for over 2000 years democracy was avoided like the plague because of the chaos it brought. Until the United States which gave us a representative democracy. You cannot have any form of socialism and an effective democracy because socialism always leads to oppression and the suppression of opposition. Democratic Socialism is an oxymoron. You want real oppression, the closer one gets to true socialism or other forms of state control, the closer one gets to complete oppression. The Church has supported one form of another of state control for most of the last 1500 years. So the Church should get out of politics.